There’s no doubt that people are spending less and less time tied to their desktops and more of their time using mobile devices. With tablet sales expected to hit 172 million units (IDC) and close to one billion smartphones estimated to be sold globally in 2013 (Statist), having a mobile presence is no longer a nice-to-have, but a must. In fact, our own profiling research using our AskingCanadians panel finds that smartphone ownership is up 14 percentage points from 2011 to 57 per cent. Moreover, 21 per cent of people have made purchases using their mobile phones either by visiting an e-commerce website using their phone’s browser, using a shopping app, or by paying directly using a mobile payment app. If you haven’t already done so, it’s time to start thinking about making your business mobile optimized. But where do you start? 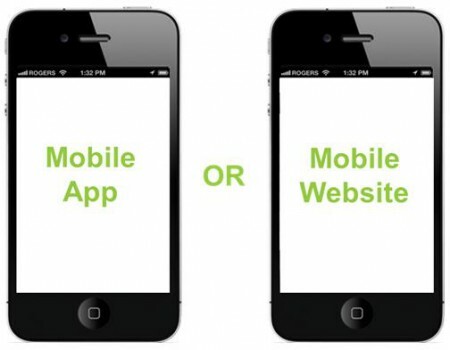 What solution is best for your business; a mobile website or a mobile app? Mobile apps are applications that have been designed to work on specific mobile devices. Similar to websites, mobile apps can access and use the Internet but because they are saved locally on your device, they are accessible offline. Arguably the best advantage of mobile apps is that they offer better graphics and imagery, more interactivity and better overall user experience because they have access to the native hardware on your device such as your camera, speakers, GPS, storage etc. Generally apps are best if you have users that frequent your site and interact with your content on a regular basis because they can streamline tasks such as logging in, checking newsfeeds, communications and actions that offer a robust interaction. Think Facebook and Twitter and how much easier it is to access this content via the app rather than the logging into the web version. Mobile websites function and act the same as a desktop website except they are designed to fit smaller screens like smartphones and tablets. Users won’t get the same level of user interaction and personalization that an app can offer but mobile sites are often less expensive to produce. Unlike apps, mobile websites don’t require a download therefore making them more accessible to a larger audience and easier for your audience to share content across social networks like Facebook. Once developed mobile sites are better for scalability and easier to update and maintain. The use of responsive design is becoming much more commonplace in the creation of mobile websites. Responsive design allows you to create one website that can be viewed on desktop and mobile environments because it will automatically adapt the screen size, content, layout and images to the device of each unique visitor. Which solution is best for you and your business? That all depends on your users. At Delvinia, we take a customer-centric approach to define the right strategy for your brand. Mobile apps and mobile websites both have distinct advantages and disadvantages. In an ideal world where budget is not an issue the optimal solution is to employ both. But, odds are budget is an issue and you will have to choose one solution. Before finding a solution you need to determine what type of users you have, what type of user experience you want to offer and the best way to provide content. Look at what types of devices your users are accessing your site with. If you want to build an app, you’ll need to build a different one for each device’s OS, whereas one website can work across all devices. Yes, apps do offer a more robust and interactive experience but you need make sure your content supports the need for an app and you need to know if your audience actually wants an app. Understanding how your customers interact with your brand, and uncovering ways to improve their experience, is where a customer journey map can be useful. By understanding why your customers make the choices they do, you’re better able to make sound business decisions about which digital touchpoints will be the most effective. If your audience is simply looking up contact information or maybe you’re seeing an increase of mobile users viewing your existing website then all your users need is a mobile site to improve the user experience. In the end, before you decide on a mobile app versus a mobile website; get to know your users and understand how they use your content first.